Anne Hawley, director of the Isabella Stewart Gardner Museum, stood in the new glass corridor with architect Renzo Piano on the day they unveiled the Gardner's new wing to the media. 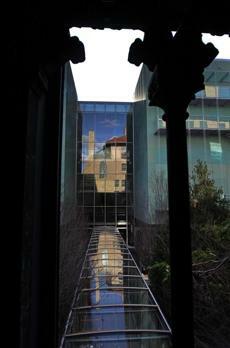 The glass corridor connects the new wing to the palace. Anne Hawley, director of the Isabella Stewart Gardner Museum, outside the new wing. The lobby at the main entrance to the new wing. The central stairway at the Gardner Museum. Architect Renzo Piano spoke about the new wing in the Calderwood Hall at the Gardner Museum on Jan. 11, 2012. The Living Room of the new wing is a space where guests can talk to museum staff members. The guest book, "Libro Azzurro," made by artist Stefano Arienti, where visitors can leave their mark. Pieranna Cavalchini, curator of contemporary art at the Gardner Museum, artist Stefano Arienti, and artist Lee Mingwei in the new exhibition gallery. "Salome" by artist Victoria Morton is exhibited as part of her solo show in the new gallery. Colleen O'Shea, objects conservation technician, unwrapped artwork in the restoration room in the new wing. At the Calderwood Performance Hall, musicians rehearsed for the opening performance. At the Calderwood Performance Hall, musicians practiced for the opening performance.